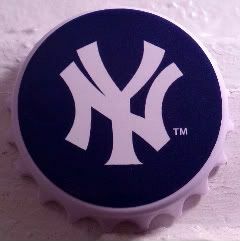 joy magnetism: Thhhhe YANKees WIN! Ya'll know I loves me some cute boys. Ya'll know I loves me some navy and white. So, put the two together, plus free tickets, and yeah, I'm there. I'm not affiliated with any pro team. I mean, I grew up in North Carolina, so the only team we had remotely near us were the Braves, and even then, I didn't pay attention to them until college. And even then, only because the boycrowd I hung around liked 'em. But that doesn't stop me from appreciating an MLB game, especially in one of the new stadiums in town. I mean, really, who doesn't love a gorgeous day in a ballpark. And I had so wanted to visit the park that's caused such a stir over the last few years. Despite their still not being able to fill the seats, particularly in the lower levels, Yankee Stadium is fabulous. Even if you miss the old school feel of the old house, this one makes Baseball feel more like an Event. The concourse is wide and long, and every turn yields a new corporate sponsor or restaurant, or both. The grandstand seats were pristine and comfy. The views were spectacular. And, in its second year, it still has that new [insert cracked joke here] cement feel. My only complaints were the extremely slow cashiers waiting for French fries to cook (really? bottom of the 2nd to the top of the 5th? really? ), and the fact that if you're building facilities in the year 2010 for the self-professed best team in the history of baseball, the restrooms should be 100% sensored and with like a field of stalls. I mean, really. But, all in all, it was a great day with good company, and even better, the Bronx Bombers kicked the snot out the Minnesota Twins - 7-1. Yay! In a totally shallow note, how pretty is this bottle-opener magnet, particularly on this green background? While I can't cheer for anything Yankee (don't tell kev's relatives) I'd love to see the stadium. I like Baseball because you don't have to pay as much attention as the other sports, it's easy to follow, and you can eat and drink as much as you want. Most ballparks these days seem almost like theme parks. Have you been to the Ted here in ATL? There is all kinds of games, rides, historical stuff. Quite the entertainment experience. Damn. Why won't Blogger let you edit? Heh. I know. Except for not putting up a Duke magnet on this blog, I'm pretty equal opportunity sports magnet owner. Is the Ted new? Or is that the baseball stadium with the fun Coke park up top? I didn't see any rides, though. We did the baseball stadium and the Falcons stadium.